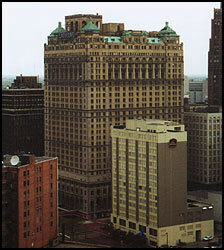 Detroit is known for one of the most stunning collections of pre-depression architecture in the world. The past two decades have seen several of these treasures sit vacant, waiting for economic revival. On these pages you will find information about the past, present, and future situations of a few of these landmarks. It is my hope that this information helps you gain an appreciation for the importance of both the history and continued survival of these buildings. "Detroit's Statler and Book-Cadillac Hotels: The Anchors of Washington Boulevard"